Nighttime Diapering, You CAN do it! These sweet little puppies are quite the bargain and they’re great for nighttime diapering. 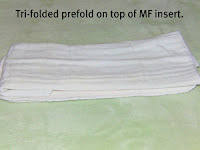 You can fold the cloth into thirds and then lay it on top of the insert or you can wrap it around the insert. Folding it does give you a little more for absorbency. If you haven’t come in contact with good quality wool, you’ll be pleased to find that it is not the scratchy material you may be familiar with. The fiber in wool is able to hold 30% of its weight in water. That right there should make you run right out to buy the next wool cover out there! It’s incredibly breathable so it can be worn in warm climates and the summertime. You can layer your inserts on top of each other. 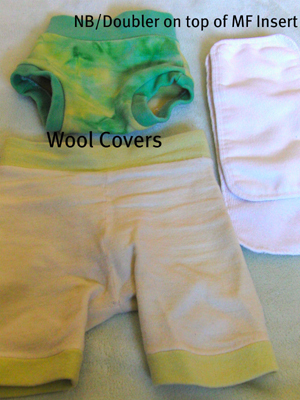 Pictured I have layered a newborn/doubler insert on top of a microfiber insert. I’ve also used a microfiber insert on the bottom, a hemp insert in the middle and then a newborn/doubler insert on top. It’s like a hemp sandwich! If you do use a doubler insert remember to position it in the front if you have a boy and in the back if you have a girl. I have layered regular inserts one on top of the other and I don’t recommend it. Major gapping going on around the legs! Inserts like the Knickernappies Just Hemp will give any pocket diaper a super absorbent boost and they're super trim, you can even add two to your already stuffed pocket diaper. Want to skip right past having to double or even triple your inserts? Give the SuperDo a try! It's all the inserts you love combined in one quick drying ultra absorbent super soaking night time insert. This is one of my absolute favorite ways to stuff my daughter’s nighttime diaper. First I wrapped the prefold around my insert and then I thought I’d try trifolding them. After folding them into thirds I place the prefold on top of the insert. It’s very absorbent and there are no gapes around the legs. Elizabeth (aka Bert) is a stay-at-home-mom and contributing writer for She Thinks Media. She lives in the Twin Cities with her husband, Ben, her son Buggie, and daughter Lady Bug. When she's not trying to convince Buggie to expand his interests beyond Thomas the Train or put his pants back on she's writing about her experiences as a mom on her blog, First Time Mom (FTM). After all, Bert maintains there's a first time for everything, even if you have more than one child! You are right, wool is the best! 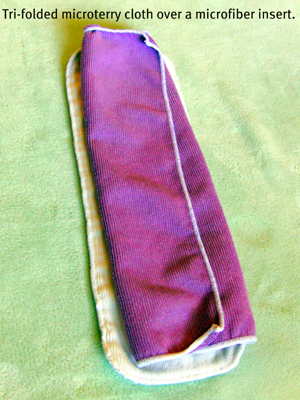 I use the SuperDo's, but I find I have to add a Just Hemp doubler, too; the SuperDo doesn't quite hold what my daughter (who still nurses a couple times a night) puts out. Haven't tried out wool cover at night, but it's not as close to the legs as I would like; when she wore it in the daytime, her pee just ran down her leg. Been a little gun-shy about using it again.